A challenging full-body program designed to help you sharpern the mind -body connection! 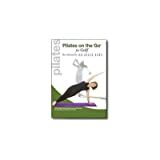 The Pilates method is a form of isometric exercises developed and practiced to simultaneously stretch, strengthen, tone and align the body, while eliminating excess tension and strain on the joints. Maria Leone, owner of the reputable Bodyline studio in Beverly Hills, has over fourteen years experience teaching pilates. A former professional dancer and a black belt in tae kwon do, Maria's unique style focuses on precise movement and body-mind discipline. Maria trains clients of all ages and levels and is known within the pilates community as a "teacher's teacher". Past and present clients include Jennifer Garner, Susan Dey, Pierce Brosnan, and Gina Gershon. Take 5 strokes off your game.